Miami has evolved into more than a tropical getaway. The city has been moving up on the list of cities that attract deep-pocketed overseas investors. Miami has long been known as a beach resort and a favoured second-home destination for Americans seeking white sand, warm waters and nautical adventures. But the city has evolved into more than a tropical getaway. Today, Miami is a thriving financial center and the site of regional headquarters for many companies serving South America. It is also becoming a hub for art and culture, hosting Art Basel and Design Miami each December and accruing cultural attractions of its own: from the Pérez Art Museum Miami to the thriving muralist district of Wynwood. The city’s latest building boom has also drawn a range of international starchitects to its shores, including Norman Foster, Rem Koolhas and Renzo Piano, and their cutting edge buildings are catering to an increasingly global clientele. Miami has been moving up on the list of cities that attract deep-pocketed overseas investors. In 2009 the city ranked 29th on a list of the most important cities to high net worth individuals, according to Knight Frank’s annual Global Wealth Report. In 2014, the city ranked seventh. Miami’s rebound from the financial crisis has been remarkable. Following the housing market crash in 2008, median home prices fell by 48 percent and construction came to a virtual standstill. But in the building boom that followed, fuelled largely by cash buyers from overseas, prices have bounced back to an all-time high. A slew of new towers are re-shaping Miami’s skyline, many of them luxury blocks with lavish penthouses priced upwards of US$30 million. After several years of steep price growth and frenzied activity, however, the market is easing. Some analysts warn of a possible price correction, while others say today’s market conditions differ from the mid-2000s housing bubble, which was largely stoked by banks approving mortgages that couldn’t reasonably be repaid. According to Jay Parker, CEO of Florida Douglas Elliman, the current slowdown is simply a sign of a maturing, stabilizing market. “Market conditions are shifting from a previously unsustainable pace to one with a better long term outlook,” he says. In this feature we look at the latest property launches and market conditions in the city’s most dynamic neighbourhoods: breezy oceanfront condos in Miami Beach; low-rise properties South of Fifth; sparkling towers in Park Grove and urban offerings in Downtown. Miami Beach, the slender barrier island between Biscayne Bay and the Atlantic, continues to be the most coveted area among well-heeled buyers. The beach town is known for its Art Deco pastels and white sand beaches and today the district features a string of new luxury condos by famous architects that include resort-style amenities overlooking the turquoise sea. Over the past few years, many of these projects haves been selling for record-breaking prices. In 2014 two triplex penthouses at the John Pawson designed Residences at Miami Beach Edition sold for US$34 million. Then a US$60 million duplex penthouse sold at Norman Foster’s Faena House, an ambitious new project from developer Alan Faena that also includes an adjacent condo building with prices ranging up to US$50 million. “All of South Florida is experiencing a boom, but in particular Miami Beach is in a league of its own,” says Ophir Sternberg, founding partner of Lionheart Capital. “It’s very hard to get projects approved and so whatever gets approved or built maintains its value.” The last building boom saw many projects built on speculation with low deposits. But in this cycle, Sternberg says, lenders have been more selective. 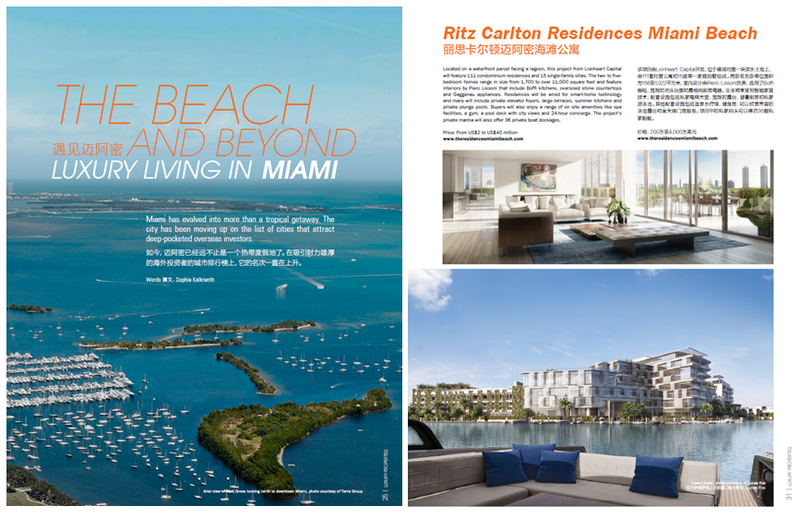 Sternberg’s company is currently building The Ritz Carlton Residences Miami Beach, a waterfront development located on seven acres facing a lagoon. The property will include 111 condominiums, 15 villas and a landscaped site complete with gardens, running trails, pools and 36 private boat dockages. Italian designer Piero Lissoni has designed the interior spaces, which include large terraces, summer kitchens and private plunge pools. At the time of writing the project was over 60 percent sold. Cash buyers from Latin America and Europe largely fuelled Miami’s recent condo boom, but in 2015, the strength of the US dollar and currency devaluations in Brazil, Argentina and Russia dampened sales in Miami Beach. The city usually has more than double the US average of residential cash buyers, a sign of its position as a preeminent American market for overseas investors. Cash buyers previously accounted for about 75 percent of all purchases in Miami but fell to 68.9 percent in 2015. However, according to Dina Goldentayer, a real estate agent with ONE Sotheby’s International Realty, the buzz around a declining number of international buyers is exaggerated. “The media is perpetuating the idea that the buyers have left the marketplace when that’s not really true,” she says. One of Goldentayer’s recent sales in South Beach closed for over US$11 million, and both the seller and buyer were Russian. Oceanfront land is scarce in Miami Beach, and currently only a few residential projects are being built. One of these is located on the grounds of the former Golden Sands Hotel. Named L’Atelier Residences, the 19-story building is designed with lush landscaping from Swiss designer Enzo Enea and a resort-style oceanfront infinity pool that fronts 120 feet of pristine sand beach. The glass building is designed by Luis Revuelta and includes three- and four-bedroom layouts with half floor units of 2,300 square feet, full floor units of 4,600 square feet, and two 8,000 square feet multi-level penthouses. For the interiors developers SGM Management and W Capital Group enlisted American design guru Holly Hunt, who designed the lobby and selected the luxury brands used for the kitchens, bathrooms and appliances. Prices range from US$4.3 to US$10 million. Further north, an oceanfront parcel adjacent to the North Shore Open Space Park will soon house 87 Park, a luxury condominium designed by Renzo Piano Building Workshop. The project is developed by Terra Group and Bizzi & Partners Development and includes 64 units in a 20-story tower with prices around US$26,000 per square foot. The recipe of oceanfront land plus starchitect has been raising the bar for luxury living in South Florida and lifting prices to record highs. But the market is showing signs of a slowdown. The supply of new projects in Miami has slowed resale price appreciation, which has been spiking for the past two years. According to report from Douglas Elliman, a Miami-based brokerage firm, there were almost 29 percent more new listings at the end of 2015 compared to the previous year. Meanwhile condo sales totaled 765 units during the fourth quarter, nearly a 20 percent drop from the end of 2014. Dina Goldentayer at One Sotheby’s International Realty agrees. “Compared with this time last year the market is not as active, but the buyers I’m working with are still very serious.” Plus Goldentayer says she hasn’t seen a drop in prices. “We might not have as much activity but the next sale is still higher than the last.” The current challenge for agents is adjusting sellers’ expectations as increased inventory has turned Miami into a buyer’s market, and with plenty of options available, buyers are taking their time. Located on a waterfront parcel facing a lagoon, this project from Lionheart Capital will feature 111 condominium residences and 15 single-family villas. The two- to five bedroom homes range in size from 1,700 to over 11,000 square feet and feature interiors by Piero Lissoni that include Boffi kitchens, oversized stone countertops and Gaggenau appliances. Residences will be wired for smart-home technology and many will include private elevator foyers, large terraces, summer kitchens and private plunge pools. Buyers will also enjoy a range of on site amenities like spa facilities, a gym, a pool deck with city views and 24-hour concierge. The project’s private marina will also offer 36 private boat dockages. Price: From US$2 to US$40 million.